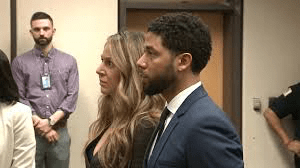 ‘Empire’ Actor Jussie Smollett has ALL charges dropped…. In a stunning move on Tuesday morning, Cook County prosecutors dropped all charges against the “Empire” actor Jussie Smollett, who had been accused of staging an attack in downtown Chicago earlier this year. “We believe this outcome is a just disposition and appropriate resolution to this case,” a prosecutor said in court in announcing the dismissal of all 16 counts against Mr. Smollett, The Chicago Tribunereported. The statement went on: “Jussie is relieved to have this situation behind him and is very much looking forward to getting back to focusing on his family, friends and career.”…. Could the Chicago’s Cook County DA have problems with the two ‘attackers’ as witness and truth teller also? Smollett’s lawyer Patrica Brown Holmes does a presser in the court house hallway and questions why the story raced ahead based on so little facts…. Mayor Emanuel and the Chicago Police Chief come out hard against the dropping of the case….